The Sisters Flotilla stretches off into the distance. 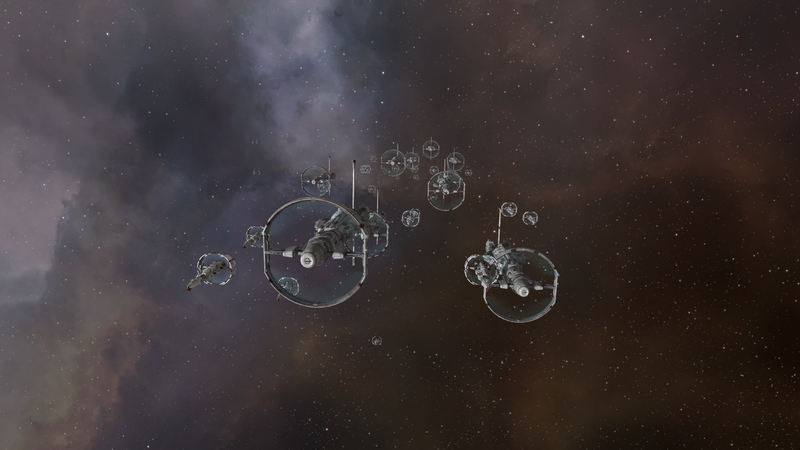 Strange as it may be, I find few things as majestic as a fleet of ships flying in formation. There’s something very elegant as seeing a multitude of ships flying with a singular purpose, acting for a single goal, with each having its part to play. Ships flying through the inky depths of space are graceful enough on their own, but put them together with others of their kind, dancing together among the stars, and they become much more than the sum of their parts. It’s a bit weird that a few tons of metal could elicit this kind of reaction in me, but I’ve always had this fascination with fleets. Heck, I even get giddy when a few ships happen to join me in a warp tunnel as I fly to my next stargate. It is perhaps ironic, then, that I focus so much on individual activities as opposed to activities where I could enjoy flying in a fleet more, but that’s a musing for another time. 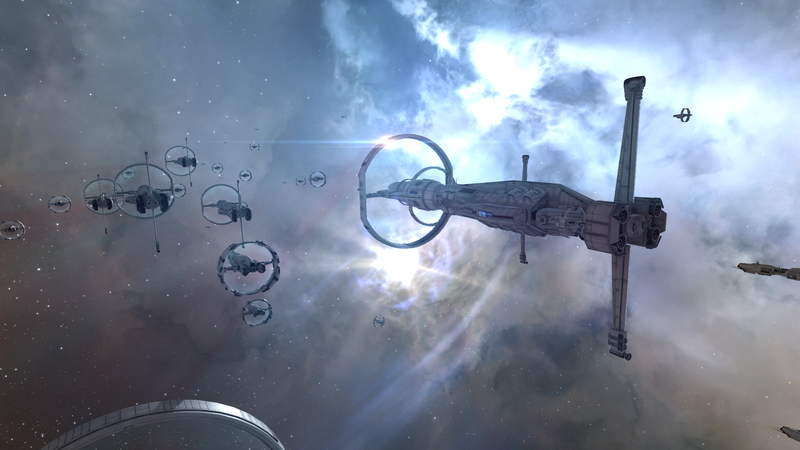 Wisps of nebula set an impressive backdrop to the fleet. 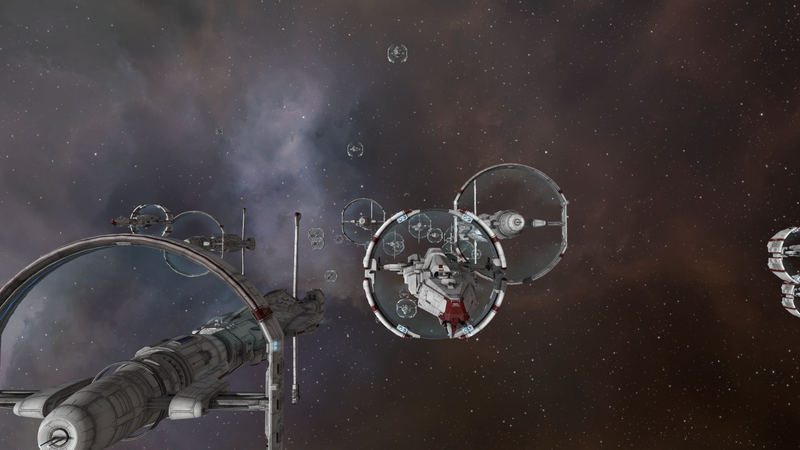 I bring this up because the Sisters of Eve have been spotted flying fleets in the various Drifter systems in Anoikis. The Sisters’ interest in the Drifters is perhaps a tad surprising seeing as how they traditionally focused their research on the Eve Gate and how to open it again. But considering their settlment in Thera and the substantial resources they committed to whatever it is they found there (presumably Sleeper in origin) the Sisters’ sudden appearance in the Drifter wormhole systems is much less surprising today than it might have once been. Perhaps more surprising, however, is that they are not even trying to hide in the Drifter systems. When they first settled in Thera, they managed to hide both Thera and their presence in it exceptionally well, despite the resources they needed to move there. In the Drifter systems, however, they are not bothering to mask their presence, which is particularly odd given that their ships are particularly suited to mount cloaking devices. Indeed, their fleet can be detected from any corner of their system. Between my love of fleets, my love of the designs of Sisters’ ships, and the ease with which I could find the fleets (especially given my last foray), it was a no-brainer that I had to track down one of these flotillas. 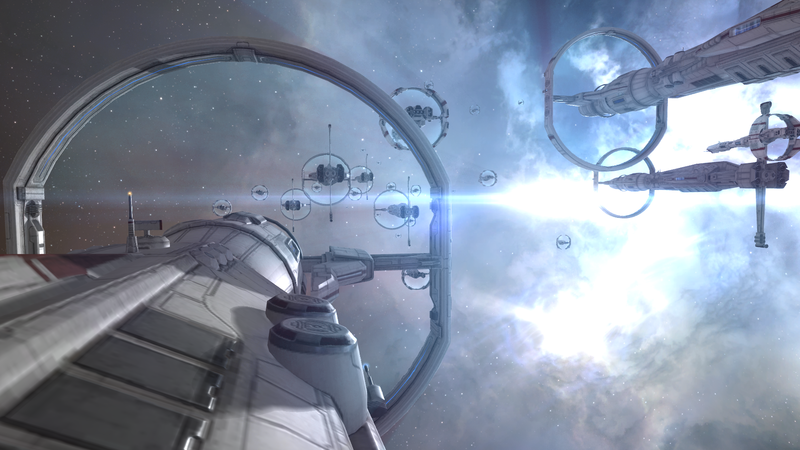 The ring-shaped warp drives are an instantly recognizable feature of a Sisters ship. As expected, the hardest part of the entire trip was finding an entrance to a Drifter wormhole, but a conversation with a few friends managed to point me to the right direction, and within a few minutes I was on my way. I quickly entered the now-familiar Drifter systems, and for once ignored the large sensor echo that represented the Drifter Hive that could be found in the system. It was a little odd to be ignoring the Drifter mystery for once, but I’ve waxed poetic enough about the Hives, and my intel suggests that little has changed since the collapse of the unidentified sleeper devices. Instead, I focused on a second, smaller (though no less detectible) sensor echo representing the Sisters flotilla. After making sure I could find my way back to my entrance wormhole, I eagerly set a course. The fleet’s destination is unknown. As the warp tunnel collapsed around me, I have to admit, my jaw dropped. I’ve always found the Sisters’ hull designs to be particularly attractive, but to see them arrayed in such a stunning fleet took my breath away (or would have if my mouth, throat, and lungs weren’t already filled with an oxygen-rich liquid that doubled as a way to cushion inertial stresses while connected in my pod). Dozens of gleaming white ships, each class with those peculiar ring-shaped warp drives that still baffle non-Sister scientists, stretched off into the distance, countless beacons in the night. A group of 8 Nestor-class battleships formed the spine of the fleet, lumbering along the flight patch, with one leading the way and another picking up the rear. Their forward-mounted warp drives were large enough to pilot a frigate through. 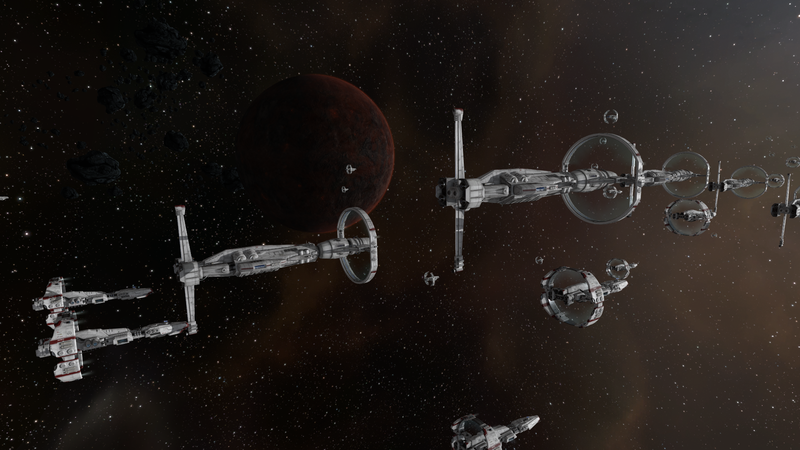 The fleet is currently stationed near one of the shattered planets. Each battleship had a complement of Stratios-class cruiser attendants to act as screens for the much more massive Nestors. The Stratios’s design has been my favorite cruiser design (perhaps even my favorite design period) since the Sisters introduced it a few years ago. Not only do they offer an stellar (pun very much intended) sensor suite to aid in exploration activities, but their ability to mount covert-operations cloaking device as well as a suite of offensive weapons makes it well-suited to my preferred piloting style. Throw in an elegant hull design and that gleaming white hull that stands out so well from other starship designs, and its little wonder that I find myself looking for any excuse at all to take my own Stratios out for a spin. Finally, comparatively-tiny Astero-class frigates flitted among their larger brothers. 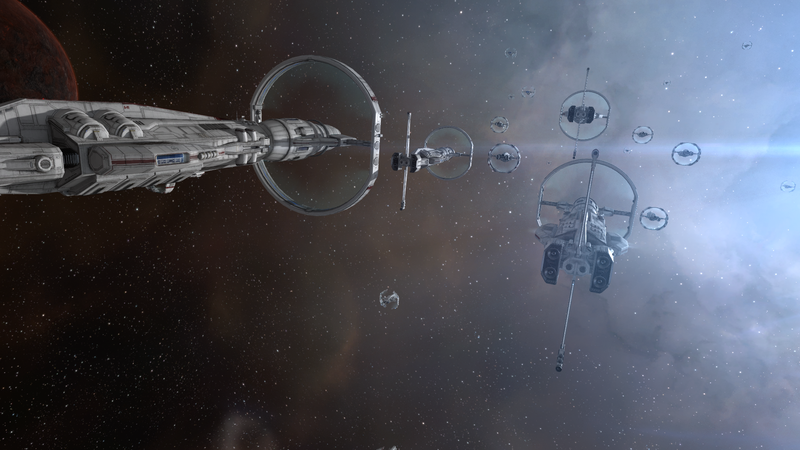 After going on for so long about the virtues of the Stratios, I’ll just say that I find the Asteros… cute. Five fleets of this size represents a significant commitment of Sisters’ assets. The fleet didn’t appear to have much in the way of organization. Nor did they seem to be in any particular hurry. Indeed, from all the activity I was seeing, it was a minor surprise that they were all pointing in the same direction, although that direction didn’t appear to be to anything significant. And, of course, their entire purpose for being there is a bit of a mystery. They are presumably out to discover something, but just what they’re trying to discover is anybody’s guess as of now, though I’m sure the Sisters will announce their intentions when the time is right. Still, for all those problems, the fleet itself is still a sight to see. I may not always see eye-to-eye with the Sisters’ in terms of their overarching goals, but they do good work and design gorgeous ships, so I suppose I can’t really complain. Attractions: Sisters of Eve flotillas. System: Barbican can be found in J110145, Conflux can be found in J200727, Redoubt can be found in J174618, Sentinel can be found in J055520, and Vidette can be found in J164710. Potential Hazards: Few beyond the normal dangers of wormhole space. No Drifter or Sleeper rats were found at all during the observation of this site. While I remained cloak while here, I likely didn’t need to be and I haven’t found any indication that the fleet turns hostile. Still, you will be wormhole space so caution is always advised. This entry was posted on February 28, 2016 by mark726. It was filed under miscellaneous and was tagged with miscellaneous.